As part of the Sherwood Forest Archaeology Project, a computerised map of Sherwood Forest in medieval times is being produced. The map is based in Geographic Information Systems and is based on historic mapping research, LiDAR data, historical documentary research, secondary published sources, alongside the results of excavation, fieldwalking, survey and more from the Sherwood Forest Archaeology Project, and previous published work. The output from the map will be in a number of formats including web-based, paper publication, and via mobile applications. The map primarily focuses on developing a high medieval landscape, located temporally in the 13th-14th centuries following the Statutes of Merton and the Charter of Commons in 1235. The map will be an interactive digital map, which is designed to enable further research, particularly with regard to locating the previous earlier medieval landscape of wood-pasture, and heathland, and also for futurescape landscape planning in-line with initiatives being undertaken by organisations such as the RSPB Futurescapes for Sherwood Forest landscape and habitat regeneration . Although there have been previous attempts at mapping the forest area (unsuccessful) this map has been constructed from scratch via research at the archives and online, alongside extensive fieldwork. This is the first such attempt to map the forest as a digital database, embedded not only with historical information regarding fields, woodland, heathland, villages etc, but also records and entries such as extracts from the Sherwood Forest books, Nottingham Borough records and more. Construction of this map in Geographic Information Systems was begun from scratch in 2013 by Andy Gaunt, Director of Mercian Archaeological Services CIC. Elements of this map has been developed in consultation with Alan McCormack, former Keeper of Antiquities at Nottingham Castle; since 2013. Picture: Medieval Nottingham. Extract from the data-set for the map- GIS vector polygons representing arable fields (yellow), meadows (light green), Woodland Coppice (dark green), Heathland (Brown). ©Mercian Archaeological Services CIC 2018. The map will be fully zoomable down to street level (see below) and elements such as extracts from the Nottingham Borough Records will be available to read. Picture: Medieval streets of Nottingham- Extract from the data-set for the map- GIS vector polygons. 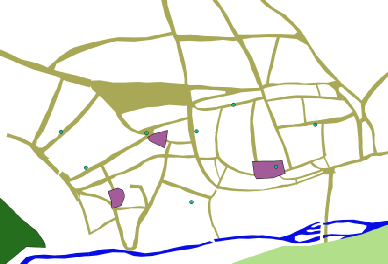 Streets (light brown), River Leen (blue), Nottingham Park (dark green), 13th century Nottingham Borough entry records. 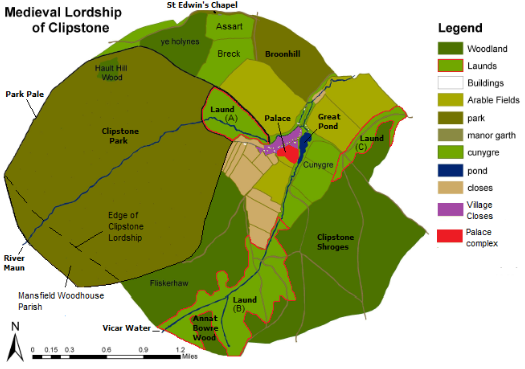 The mapping of area such as Clipstone, are based on previous work by Andy Gaunt into the designed landscape which he identified in 2011. Picture: Gaunt 2011 map redrawn by Gaunt for 2013 publication in Thoroton Society Transactions (Gaunt & Wright 2013) with extra annotation and Launds higlighted. Picture; The medieval village cores of Church Warsop (North) and Market Warsop (South) showing the double core settlement plan. Extract from the data-set for the map- GIS vector polygons. 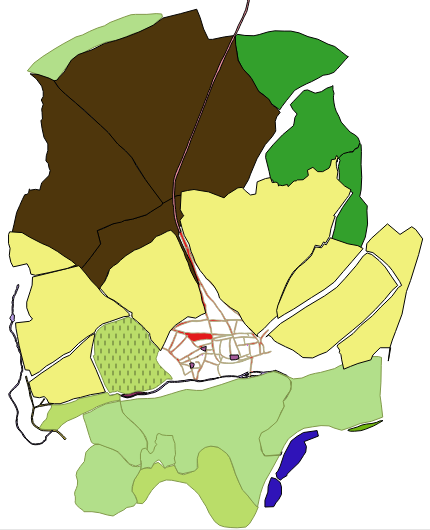 Streets (light orange), Woodland in the form of Alder Carrs (light green), arable fields (light brown) and Brecklands (green).